Most of the world’s major river deltas are sinking from human activity, increasing the risk of flooding which would affect hundreds of millions of people. 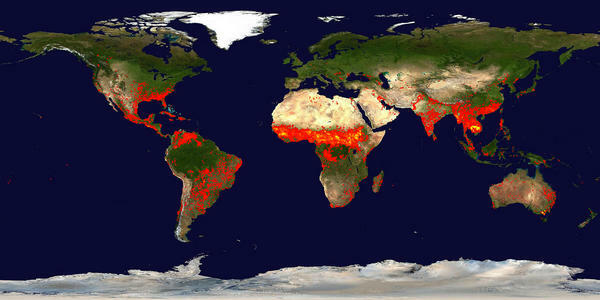 About 14 percent of the world’s population, more than half a billion people who live on river deltas, will be affected. Researchers calculated that 85% of major deltas have experienced severe flooding in the last decade, concluding that the area of flood prone zones will increase by about 50% in the next few decades as sea levels rise and more of the river deltas sink. A new study led by the University of Colorado at Boulder indicates most of the world’s low-lying river deltas are sinking from human activity, making them increasingly vulnerable to flooding from rivers and ocean storms and putting tens of millions of people at risk. While the 2007 Intergovernmental Panel on Climate Change report concluded many river deltas are at risk from sea level rise, the new study indicates other human factors are causing deltas to sink significantly. The researchers concluded the sinking of deltas from Asia and India to the Americas is exacerbated by the upstream trapping of sediments by reservoirs and dams, man-made channels and levees that whisk sediment into the oceans beyond coastal floodplains, and the accelerated compacting of floodplain sediment caused by the extraction of groundwater and natural gas. Figure below: An image of the Pearl River Delta in China taken by NASA’s space shuttle Endeavour during the Shuttle Radar Topography Mission in 2000. The areas below sea level are shown in purple. Image courtesy NASA, CSDMS, University of Colorado. The study concluded that 24 out of the world’s 33 major deltas are sinking and that 85 percent experienced severe flooding in recent years, resulting in the temporary submergence of roughly 100,000 square miles of land. About 500 million people in the world live on river deltas. Published in the Sept. 20 issue of Nature Geoscience, the study was led by CU-Boulder Professor James Syvitski, who is directing a $4.2 million effort funded by the National Science Foundation to model large-scale global processes on Earth like erosion and flooding. Known as the Community Surface Dynamic Modeling System, or CSDMS, the effort involves hundreds of scientists from dozens of federal labs and universities around the nation. The Nature Geoscience authors predict that global delta flooding could increase by 50 percent under current projections of about 18 inches in sea level rise by the end of the century as forecast by the 2007 Intergovernmental Panel on Climate Change report. The flooding will increase even more if the capture of sediments upstream from deltas by reservoirs and other water diversion projects persists and prevents the growth and buffering of the deltas, according to the study. Other study co-authors include CU-Boulder’s Irina Overeem, Eric Hutton and Mark Hannon, G. Robert Brakenridge of Dartmouth College, John Day of Louisiana State University, Charles Vorosmarty of City College of New York, Yoshiki Saito of the Geological Survey of Japan, Liviu Giosan of the Woods Hole Oceanographic Institute and Robert Nichols of the University of Southampton in England. The team used satellite data from NASA’s Shuttle Radar Topography Mission, which carried a bevy of radar instruments that swept more than 80 percent of Earth’s surface during a 12-day mission of the space shuttle Endeavour in 2000. The researchers compared the SRTM data with historical maps published between 1760 and 1922. The researchers predict that similar disasters could potentially occur in the Pearl River delta in China and the Mekong River delta in Vietnam, where thousands of square miles are below sea level and the regions are hit by periodic typhoons. For more information on INSTAAR visit instaar.colorado.edu/index.html. For more information on CSDMS visit csdms.colorado.edu/wiki/Main_Page. 2009 may be remembered as a year of more extremes of climate and weather: More drought and more deluge, with less food and less clean water available globally than the previous years. Our colleagues at MSRB believe that poultry, hog and cattle producers would cut production in 2009 to soften the blow of rising feed costs. With less meat on the retail market the prices would rise higher. 2009 will see more people out of job, and with less food available globally at higher prices, food riots could break out throughout the world. Civil conflicts could erupt in a dozen countries. In the United States seeds of large-scale civil unrests would be sown. Job riots could plague China, U.S., Europe and other countries. The 2009 Atlantic hurricane season will be somewhat more active than the average 1950-2000 season, according to Department of Atmospheric Science, Colorado State University. They estimate that 2009 will have 7 hurricanes (average is 5.9), 14 named storms (average is 9.6), 70 named storm days (average is 49.1), 30 hurricane days (average is 24.5), 3 intense (Category 3-4-5) hurricanes (average is 2.3) and 7 intense hurricane days (average is 5.0). Our Colleagues at FEWW forecast more earthquakes and more volcanic unrest throughout 2009 and beyond. There could be as much as 37 percent more earthquakes in the United States in 2009, some in areas that are not prone to earthquakes. A magnitude MW 7.9 or larger quake could strike close to Anchorage. FEWW team also believe 2008/9 may be heralding the beginning of a new period of intense global volcanic unrest. What about Climate Change Mr President-elect? “We will make decisions based on the facts, and we understand that facts demand bold action,” Obama said. What about the carbon footprint of your inauguration? The President-elect forgot to mention that Disa orchids will be flown in for his inauguration from New Zealand within 24 hours of being picked! The total bill for Mr Obama’s inauguration, including cost of the security, which will be paid by the taxpayers, will probably exceed the $160million [Figure revised according to the media estimates on January 20, 2009.] At a global average of 584g of CO2/GDP dollar, the inauguration carbon footprint on cost basis alone would be 93,400 metric tons [MT] of CO2. As for the additional CO2 created by an estimated 2 million people swarming Washington DC for the ceremony, add another 44,000 MT. By January 21, 2009, the inauguration carbon footprint will have exceeded 137,400 MT of CO2. U.S. President-elect [do as I say, don’t worry about what I do] Barack Obama looks on as Steven Chu, director of Lawrence Berkeley National Lab, speaks after being introduced as Obama’s Energy Secretary during a news conference in Chicago, December 15, 2008. Obama also named former Environmental Protection Agency (EPA) chief Carol Browner (R) to head a new council to coordinate White House energy, climate and environment policies, and Lisa Jackson (2nd-R), chief of staff for New Jersey’s governor, to run the EPA. REUTERS/Stephen J. Carrera. Image may be subject to copyright. The “Deadly Dozen” Fits into the Collapse Jigsaw!